I am so thrilled today to get to introduce y'all to the newest addition to our family - Hannah Hope Aguilar! She was born at home on (her due date!!) January 3rd at 3:09 p.m. It has taken me 2 weeks to update my blog because four children + a newborn does not equal ample blogging or sewing time! 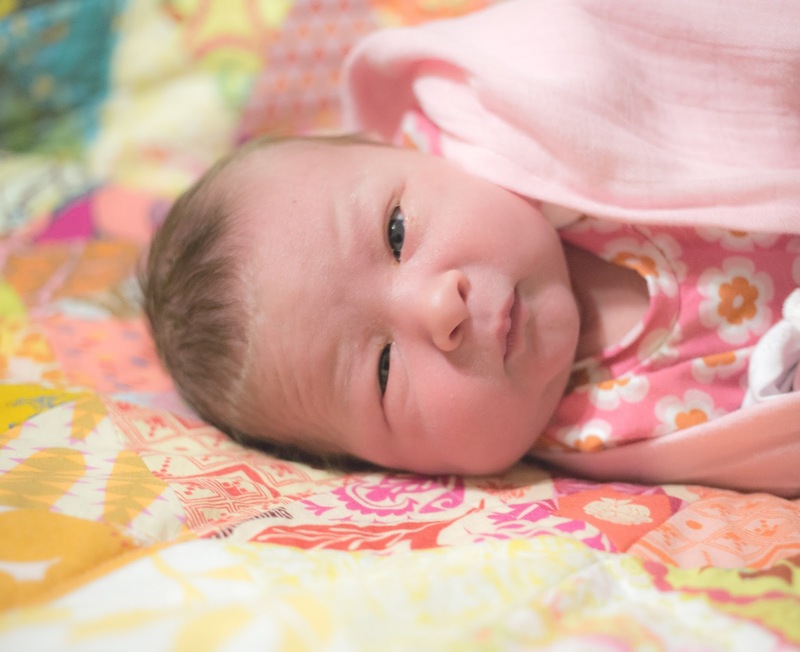 Today I want to share with you Hannah's birth story as well as a quilt and a quilt story. Let's start with the quilt story. Two years ago, in January and June of 2016, after four healthy pregnancies, I miscarried my fifth and sixth pregnancies, both at around 13 weeks into the pregnancy. I was devastated. The second loss was even harder physically and emotionally because it was more drawn out. The miscarriage took about 5 months to complete due to being a partial molar pregnancy and included many hospital stays and a bout with sepsis. To help cope with all the emotions and questions and misunderstanding of the pain, I made a baby quilt. I felt kind of silly at the time making a baby quilt, but it was almost therapy in itself. Quilting is my hobby that allows me to simmer, think, pray, and work through whatever is going on in that season of my life. It keeps my hands busy while my heart pours through it all. I loved the smaller size of this quilt because it allowed me to take it everywhere with me to do the quilting by hand. Here is Tabitha, holding the quilt for photos in 2016. I used this really fun Alexander Henry book print for the back of the quilt. When I finished the quilt, I took photos of it with my kids, but I never shared the quilt or its story. I told myself I was done having children, despite the desire I still had deep down. I focused on my family and looked to Jesus for his plan for my life. I went back to the church I knew God had placed me in, which was quite a breath of fresh air and a pivotal part in my journey. I gave the quilt to my kids to play with. The quilt of course has gotten lots of play time. Here are just a few photos that I found on my phone from just the last few months. Fast-forward to 2017, and much to my surprise, in May, I found out we were expecting again. I had not even taken a pregnancy test, but the OB caught it on my bloodwork. I had to get bloodwork once a month from the partial molar pregnancy the year before, and this was supposed to be my final bloodwork. I received a call late one evening from the OB, who was so excited to tell me the news. I think I was shaking from the shock! I can't even begin to describe the anxiety and emotions I felt. I did not want to tell anyone or even believe it myself. After the first trimester was over and the pregnancy was going along well, I switched to the care of my midwife, Robin Destafano. I just loved the support she had given me through Aaron's pregnancy and birth and was glad to go through another healthy pregnancy with her support. She came to my home for my prenatal appointments, which is amazing. Going to a doctor's office and waiting with four children in the waiting room is quite stressful, and hiring a babysitter for each appointment can be quite expensive. Now for the birth story... just scroll to the end if this is not your cup of tea. 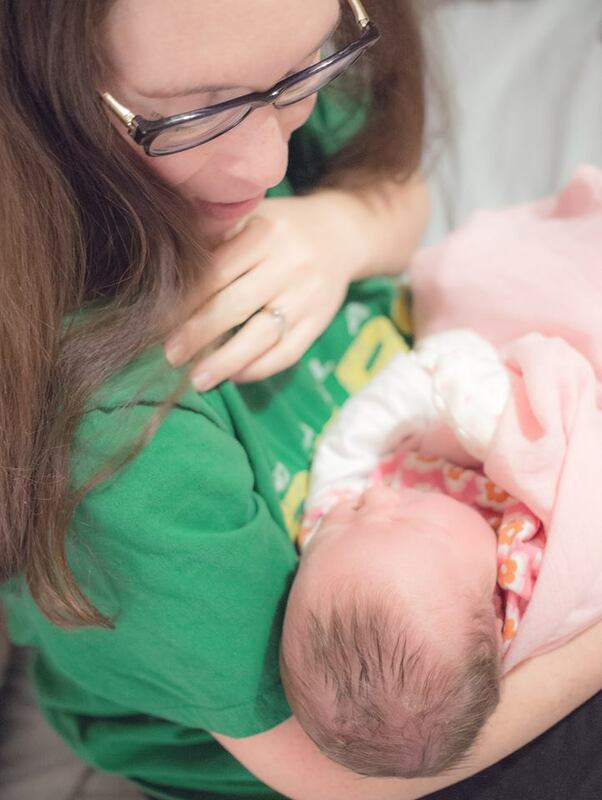 Hannah was born on a Wednesday, but her birth story really starts the Saturday before. I woke up Saturday morning with an insane amount of energy, and all I could think about was cleaning. This is very unusual because if I have extra energy, I use it to sew or go to the gym. From Saturday to Monday, I cleaned like a crazy woman. If I wasn't cleaning, I was cooking. By Tuesday, every piece of laundry was finished, every floor was mopped, every closet cleaned, and even my sewing room was completely organized! So, Tuesday, I headed to the gym and got a pretty decent work out in for being 39 weeks and 6 days, and then, by Tuesday evening, I just started feeling that pre-labor yuck. No contractions, just emotional, crampy and discouraged. I woke up at 2:30 am on Wednesday with contractions that I knew were labor contractions, but they did not hurt, were between 10 and 15 minutes apart, and only lasted about 30 seconds. Dario immediately called the midwife because I have woken up with contractions like this in past pregnancies and had a baby in my arms an hour later! The midwife arrived shortly thereafter to check on me and slept on my couch until morning. I was able to sleep between a lot of the contractions and was pretty rested in the morning. When everyone was awake, the midwife checked me and decided to go home and get a shower and breakfast. I think she said I was barely dilated to a 5 and baby was still pretty high. That morning I tried to go about my day as normal as possible, just waiting for these contractions to turn into something hard. After lunch, I called the midwife and told her to go ahead and come over. The contractions were still 10 minutes apart and pretty short, but I wanted her to come give me some herbs or do something to help this labor pick up. The midwife arrived at 2:30 pm. The babysitter arrived at the same time to stay with the children downstairs. About 10 minutes prior to this, the contractions finally started to feel more intense so I was so glad to see them both. For the next about 30 minutes, I had those hard, transition contractions that make you wonder why so many people have children. Dario and the midwife both did a great job of supporting me with counter pressure on my back, which is where I feel the pain of most contractions. Then, a few minutes after 3 pm, the midwife told me to start pushing with contractions "to take the edge off." About 5 minutes later, sweet little Hannah was born! She was a healthy sized baby, weighing in at 8 lbs and 8 ounces, and she was 20.75 inches long. She took a few extra pushes to get out because her shoulders needed help rotating. Surprisingly, I did not need any stitches, and so far, my recovery has gone very well. Here are a few photos from after the birth. Hannah's head was a little bruised from her quick exit, but she pinked up very quickly. The kids were so excited to come meet her when Dario announced her arrival. Now, I have this heart quilt to give to my sweet Hannah. I can tell her the story of hope. Deep down, God knew my heart's desire. Romans 5:5 says that "...hope will not lead to disappointment. For we know how dearly God loves us, because he has given us the Holy Spirit to fill our hearts with his love." I felt God show his love toward me through Hannah. I was not looking for another baby, but she came. She came when I had given up. She has already changed so much in just two weeks. We adore her, and she has brought so much joy to our family! I can't wait to watch her grow and see the beautiful woman she becomes. Oh she's beautiful! So glad she's here and healthy. And sorry for your losses. I had three miscarriages between my girls and they were so hard. I completely and unapologetically spoil my rainbow baby. Congrats again! I'm so sorry you went through losses. They really do change your perspective. This little girl will be unapologetically spoiled by us all as well!